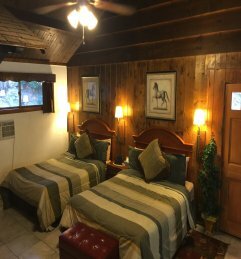 Our Fireplace Rooms can sleep 2- 4 and are located poolside with two queen beds. 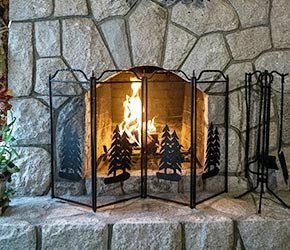 Each room has warm wood paneling, a spacious seating area with a gorgeous river rock gas fireplace and an outdoor seating area. These rooms also include a microwave, mini refrigerator,Coffee Maker and an LCD-HD TV with cable and a DVD player. 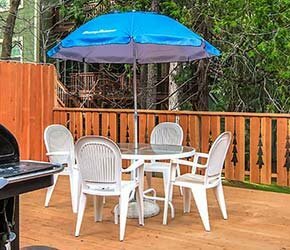 Other amenities include air conditioning, a ceiling fan, a tankless hot water heater, and free Wi-Fi Access. Rooms 3, 4, and 5 have high T&G beamed ceilings. Room 3 can connect to Room 4 and Room 5 can connect to the Deluxe Fireplace Room 6. Like the Fireplace Rooms, this room sleeps 2- 4 and has 2 queen beds. Warm wood paneling and a high T&G beamed ceiling. A spacious seating area features an impressive floor to ceiling river rock gas fireplace. Mini-Kitchenette , microwave, mini refrigerator, and an LCD-HD TV with cable and a DVD player, free Wi-Fi Access, A.C. ceiling fan. The Fireplace Deluxe Room has an enhanced private deck that will make you feel like you're a million miles away from all your worries. With lounge chairs & table seating area overlooking the forest. Propane BBQ grill. This room connect to Fireplace Room 5. Easy Access to the Pool.